A workflow for making and testing changes to your Ship application. 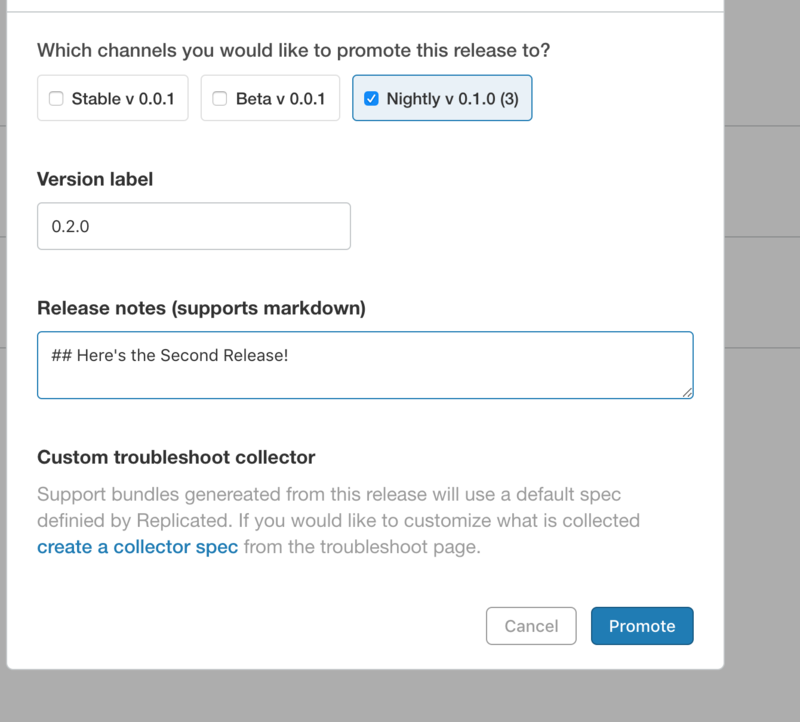 This is part 4 of a guide that walks through creating a sample application in Replicated Ship. If you haven’t followed the previous sections of this guide, go back to deploying an application before following this guide. Your entire lifecycle should look like the example here. This makes use of the Installation template function to inject metadata about the application release. To learn more, you can review the metadata fields available. Next, lets pull the updated release using ship update. This will assume you’ve already been through the instructions in Testing the installation, and that you have an existing .ship/state.json in your working directory. If don’t have a .ship/state.json from the previous step, or if you just want to start from scratch, then you can re-run the same ship init command from Testing the installation, and skip ahead to headless updates. Remove the installer directory, but leave .ship in place. By default ship update will do a headless update, but we use the --headed flag above so we can see our changes reflected in the UI. When iterating on your application assets, you can usually move more quickly by skipping the UI, and running headless updates. Now that we have a feel for how managing releases works, its time to get set up with a ship development environment for offline iteration or deliver a private image with ship.